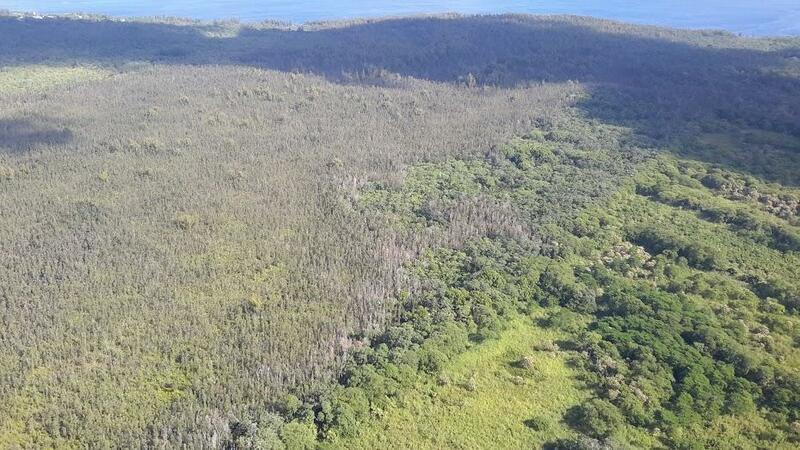 An aerial view of dead ohia trees killed by Rapid Ohia Death. State officials say the fungal disease called Rapid ‘Ōhi‘a Death is continuing to threaten native ‘ōhi‘a trees on the Big Island. 'Ōhi'a covers about 865,000 acres statewide. Recent surveys show the disease has now impacted nearly 50,000 acres on the Big Island, an increase of a little more than a third from earlier this year. But the new data reveals the disease has not spread to other islands. J.B. Friday, an extension forester with the University of Hawai‘i, remained optimistic about containing the disease. "The spread on the Big Island happened before we knew what was going on," said Friday, who emphasized that this was the first time the disease had been found in ‘ōhi‘a. "So it spread quite widely before we knew what was going on." "We continue to test possible trees from other islands. We've tested dozens of samples so far," he said, explaining that none had come up positive for Rapid ‘Ōhi‘a Death. "But if one does turn up positive, we'll be implementing measures to stop it from spreading from there." ‘Ōhi‘a is critical to Hawai‘i’s native ecosystem, especially the island’s water source. It also provides habitat for native birds and species. 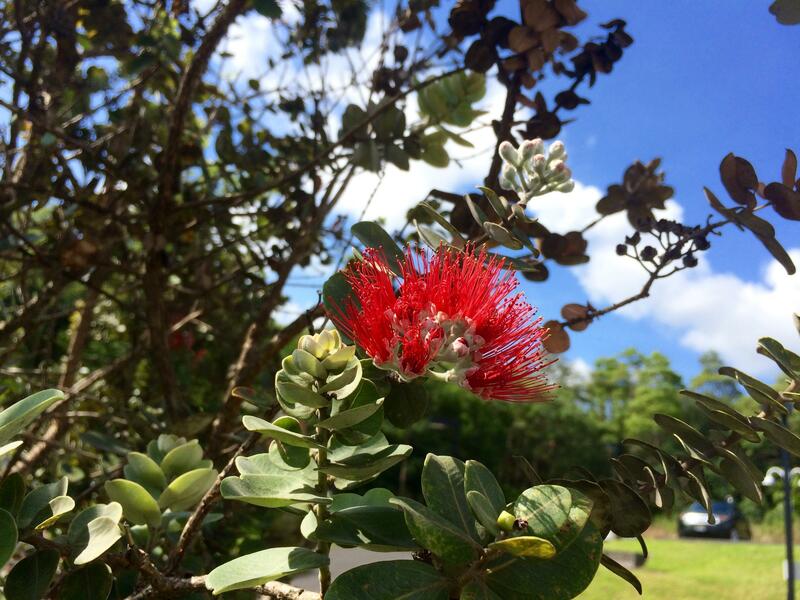 The tree and its blossom, ‘ōhi‘a lehua, is also culturally important to Native Hawaiians. The state Department of Land and Natural Resources plans to continue aerial surveys twice a year across the state. Last year the state Department of Agriculture issues a temporary quarantine rule, banning interisland transport of the wood without a permit. The DOA is now deciding whether to make that rule permanent. Rapid Ohia Death Statewide Survey Results from Hawaii DLNR on Vimeo. Hula’s most prestigious festival Merrie Monarch begins tonight. For more than 50 years, hula hālau from across the islands have descended on Hilo for the three-day competition. But some traditions are being altered this year, in light of a rapidly spreading disease that’s killing Hawai‘i’s ‘ōhi‘a trees. HPR’s Molly Solomon reports. Music fills the empty gym of St Francis School in Mānoa. Dancers line up for one last practice before heading to Hilo to compete in Merrie Monarch. One of their kumu, Robert Keano Ka‘upu, yells out notes as they glide onto the floor. One of Hawai‘i’s oldest and most culturally important native trees is under siege from a mysterious disease. So far more than 34,000 acres of ‘ōhi‘a trees have died, and it's left scientists scrambling for a solution. HPR’s Molly Solomon visited the Big Island forest where it all began. About 40 minutes south of Hilo, in the Leilani Estates subdivision in lower Puna, is what scientists are calling ground zero for Rapid ‘Ōhi‘a Death. 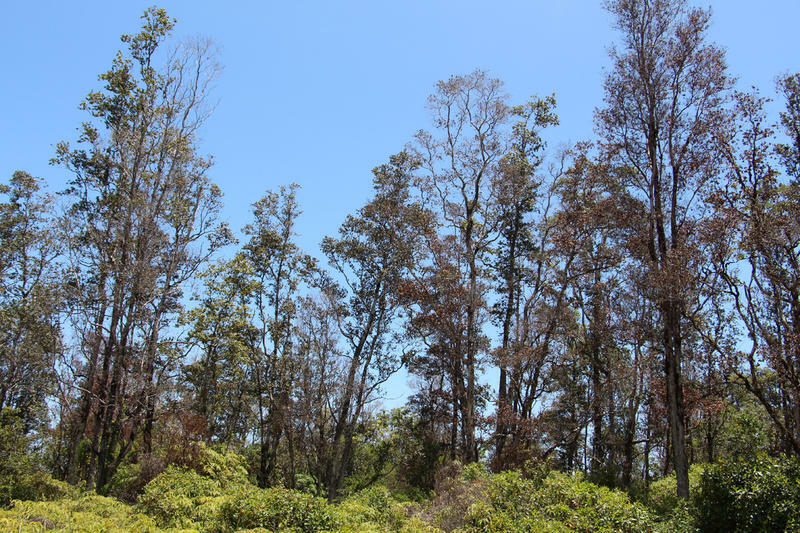 Scientists say a disease killing hundreds of thousands of ‘ōhi‘a trees on Hawaii's Big Island is spreading. Recent aerial surveys show the acreage of infected trees has more than doubled in the past two years. State, county and federal agencies collaborated to conduct the surveys by helicopter last month. 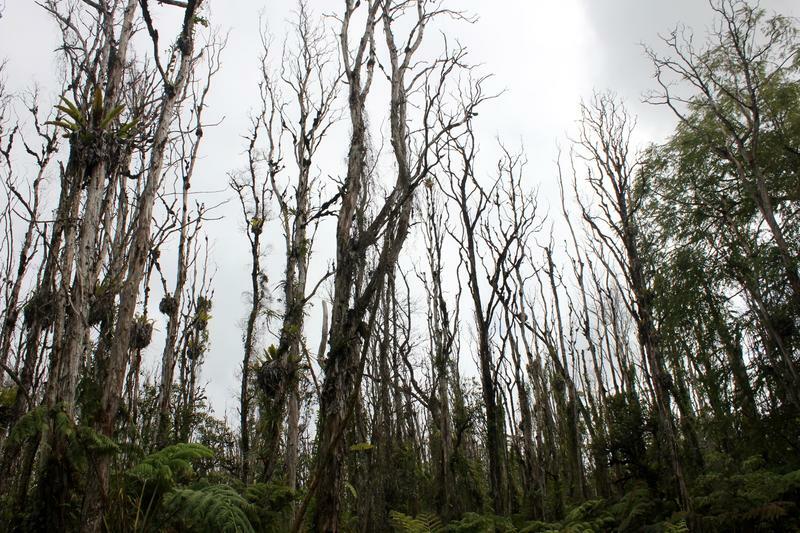 The fungal disease, called Rapid ‘Ōhi‘a Death, was found in 34,000 acres of ‘ōhi‘a forest. Rob Hauff is the Forest Health Coordinator with the Department of Land and Natural Resources.